Lacking imagination, but possessing a car and a free afternoon, I went back to Mont Ventoux for my final day of Peak Week. I sound like I’m apologizing, don’t I? I shouldn’t. I was thinking yesterday and today, as I trudged up that giant, how efficient it is for my training. Where else could you get 1600 meters of climbing in just 21 km? It’s probably the best hill repeat there is, especially since it’s so accessible. Anyhow, I decided to do an abridged version of a race I did up there a couple of years ago, which started and finished in the pretty village of Beaumes de Venise. The route has an added advantage of climbing two short cols before and after the big one, and it goes through the indescribably pretty Dentelles de Montmirail. Do not miss riding here if you ever visit the area (Rob, are you listening?). 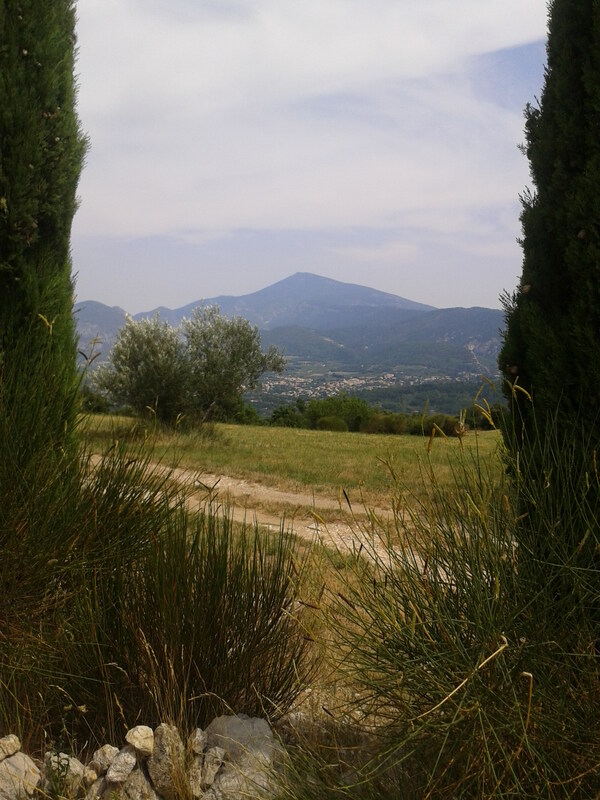 Below is an unusual view of Mont Ventoux, taken from my first col – Col de la Chaine. 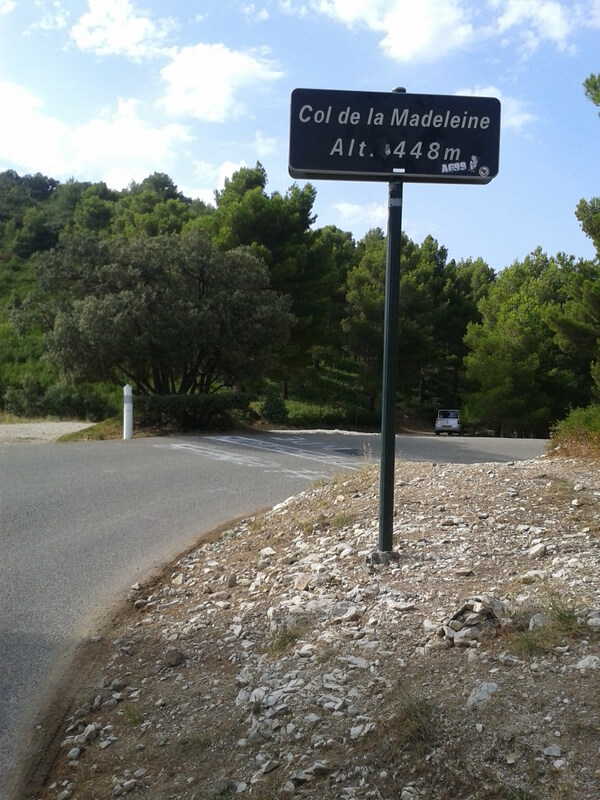 The climb (from Malaucène today) went well, but the legs were definitely fatigued. I think my time up was over 1:40. The legs were turning, just slower than usual. I’m still encouraged by this since there was a day not too many months ago that the ‘turning’ part would have been the problem. Here is my 2nd col – Madeleine (no, not that one). My feeling is that the last two numbers, with an edge to the last one, are the most important here. The climbing, as well, was of a type similar to what Haute Route is going to be like, i.e. long, consistent, steep. I’m hoping this is important, anyway, since I’ve been building the whole 2nd part of my season around this type of terrain. Time will tell. And now to the taper, which I really have no clue how to do. But have no fear; when I figure it out, you’ll be the first to know! I’m going to continue 6 days a week, but with less time on the bike. I will increase the intensity of these rides, though, so hopefully it’ll come out to something like 50% volume and 90% intensity, compared with a normal week before Peak Week. I think I’ll still do long rides on the weekend, too. I got this style of taper from a couple of good sources (i.e. doing a longer one, but not riding ‘easy’). I’ll see how it works. Somehow I don’t imagine you ever “trudge” up a mountain…. And as far as riding and visiting …. Hope you don’t get so tired of riding up Ventoux that you won’t want a slow (just what is the cycling equivalent of stroll … ramble?) back up to the summit towards the very end of the summer! Good tapering … I’m sure you’ll see some fine rides in that time too. BTW, great job of posting during all this climbing, thanks. Thanks, Suze. I’m happy someone appreciates the few stops I took for photos!